Great Basin National Park encompasses over 77,000 acres and offers the visitors a variety of outdoor recreation activities including hiking/backpacking, fishing, wildlife viewing, picnicking, star-gazing, snow-shoeing, cross-country skiing, biking and much more. You can also hike up to the Wheeler Peak (13,063) and see 5,000-year-old Bristlecone pine trees or tour the beauty of Lehman Caves. Fall is also a great time to visit and see spectacular autumn colors. Great Basin National Park has five developed campgrounds with vault toilets, picnic tables, tent pads, and campfire grills. There are no hookups or leveled parking sites. Campsites are limited to eight people, three tents, and two vehicles per site. There are three campgrounds that have accessible sites. There is one primitive campground along Snake Creek Road. Sites have picnic tables and fire rings. Lower Lehman Creek is the only campground open year round. Other campgrounds are generally open from May until October, weather permitting. Water may not be available early and late in the season, and is not available in the winter at Lower Lehman Creek. All camping is first-come, first-serve, except for the Grey Cliffs Group campground. Each campsite has a table, fire ring/grill. Although all campgrounds have water facets, you’re advised to boil the water at Wheeler Peak campground. 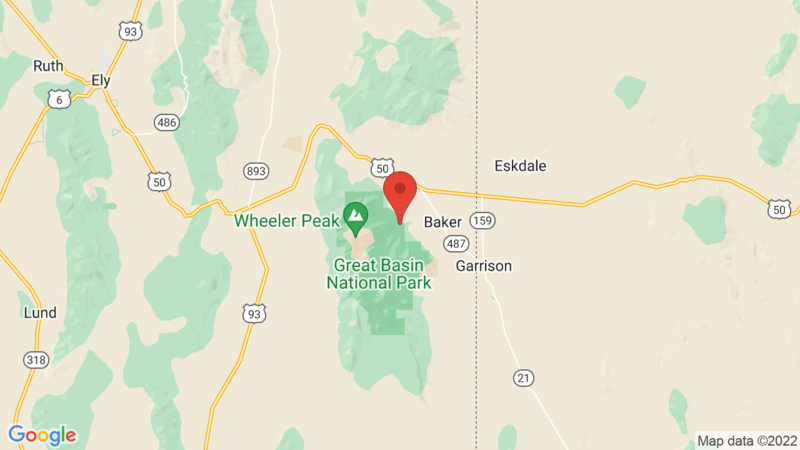 Visted Great Basin National Park Campground lately? We'd love to hear about your adventure. Did you find us useful? Did we forget something? Anything our community should know before heading out to Great Basin National Park? We stayed at the park from Sept. 16-25, 2017. The photos on this site were very helpful in determining where our 24′ RV would fit the best. We ended up in space #6 in the Lower Lehman CG due to unexpected visitor numbers and the unavailability of spaces in all campgrounds when we arrived. Space #1 in LLCG is for disabled parking only at all times, regardless of time/space availability. With the exception of that space #10 and #11, the sites are very un-level and require creative parking and lots of leveling blocks. The sites are well-separated with vegetation and have a nice feeling of privacy. The wild turkeys and deer pass through several times a day. We only drove through Upper Lehman CG, and the pavement in the spaces we could see did not look level or smooth at all. The roads were twisty and narrow up there, as well. They offer a credit card option for payment at the self-register station in each campground. Nice! The park is very spread out, so having a tow vehicle or another method of getting around is a must if you plan on doing any hiking or visiting either Visitor Center. All camping is “dry” and there are very limited supplies in the town of Baker, so come prepared with all the food, fuel (gas avail in Baker, no propane) etc. you’ll need. The water in the park is very clean and the vault toilets are kept very clean and stocked. Bring more than you think you’ll need to stay warm. If you’re looking for quiet time in a beautiful, remote setting, this is the place for you! The hikes are wonderful, and the Bristlecones are not to be missed. We did not visit the caves.